Home » SEO Articles » Can Negative Brand Mentions Hurt Your Rankings? The Answer Might Surprise You! 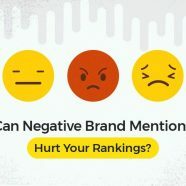 Can Negative Brand Mentions Hurt Your Rankings? The Answer Might Surprise You! We all keep hearing that any publicity is good publicity. But is it really so? And, more importantly, is it the same for SEO? We’ve all heard about the link building technique using unlinked Brand Mentions It’s a good method and, as far as we know, it works very well. But what if the unlinked brand mention that you’re so excited about turns out to be a RipoffReport post? What if it’s a blogger complaining about your services, or a news publisher reporting on some incident regarding your brand? Will Negative Brand Mentions Affect Your Google Rankings? Should you also get a link from this kind of sources as well? Will it help you or will it harm your website’s rankings? Well, you’re about to find out! In this article we will dissect how Google treats this matter and find out if negative brand mentions impact your rankings and SEO efforts. So, keep reading. In general, we all know that a good branding and PR will positively affect our business. It makes sense. People love well established brands with a lot of satisfied customers and great deals. For example, most people would still buy an iPhone over a Xiaomi Phone, although some models apparently have similar characteristics and lower prices. People buy from certain brands because of trust and authority. To obtain the audience’s trust, a brand must be well established and have good PR. For your business to flourish online, besides earning the customers’ and audiences’ trust, you also have to win the search engine’s trust. Customer and search engine trust kind of go hand in hand, but, from what we know, SEO works based on some algorithms. There are many important factors which lead to authority, from domain age and security to backlinks, CTR and branded searches. We’ll ignore domain age, as it’s not really something we have control over, but we’ll be focusing on the other ones. As presented in this link building lessons article, websites with a high percentage of branded anchor text backlinks tend to rank higher than the ones with a high percentage of commercial anchor text backlinks. The cause for this phenomenon is probably Google’s association of these links with naturalness. When talking about you on the web, people are more inclined to link to your website through a branded or URL anchor text, rather than through a commercial anchor text. A website can also have a high number of unlinked brand mentions across the web. They are often called citations and are very popular within the local SEO field. The key element here is relevancy. The citations you’re getting to your local business should reflect the location of your business. If you’re in Seattle but get citations from Russian websites that mostly mention Russian businesses using Cyrillic characters, don’t expect your rankings to grow very fast. On the other side, if your business targets a global market, then it makes sense to have all sorts of unlinked mentions across different countries. Relevant content is also important, so don’t spam on every site. Also, keep in mind that mentions that do contain backlinks, especially dofollow ones, have a lot more impact on your search engines than mentions that don’t. How unlinked mentions compare to linked mentions. So, generally speaking, Google does take a look at your unlinked brand mentions and the content surrounding those mentions, but it’s better if you can get a link back to your website from them. That way you can be sure that you maximize the potential of the mention, as it’s both a mention and a link at the same time. And remember, you want to get mentions from reputable websites that are relevant to your niche and geographic targeting, be them linked or unlinked. Creating them yourself using the same IP might turn out to be a waste of time and could actually get you into some trouble. A great way of finding your unlinked mentions is Brand Mentions, a web mention monitoring tool. It has a lot of advanced features, but this is one of the best, as it enables you to establish a connection with webmasters that mention you and potentially acquire a link. We can categorize search queries into two types: branded and non-branded. A non-branded search query would be “keyword tool” and a branded search query would be “cognitiveSEO keyword tool”. You want to be ranked on both of them. If you’re not ranking for your own brand name, that is kind of bad. You either chose the wrong brand name, or you’re heavily penalized by search engines. Non-branded keywords, for example, have a high search volume, which means a lot of potential customers. However, there’s a lot of competition there, so they are harder to rank for and the CTR might be lower. Branded Keywords, on the other side, have probably a low search volume, but they are very easy to rank for (if you are that brand) and the conversion rates are very high, as usually the users already know what they want. Although this is speculative, some experiments and observations (including some of our own) have shown that branded keywords can eventually increase the rankings for non-branded keywords. So, if a lot of people search for “your brand + keyword” and click on your website, you should also see an increase in rankings on the “keyword” itself. These being said, it’s always a great idea to work on your PR so that people search for your brand on the web and associate products with your brand. Not only will it increase conversion rates, but it can also help with rankings on non-branded keyword versions. Ok, so we know that Google likes branded anchor text links and looks at brand mentions across the web to establish your website’s authority. But, in real life, having more mentions isn’t necessarily better. What if you have thousands of negative reviews, mentions related to fraud or other bad stuff? That could affect you business deeply, or even send it into bankruptcy. Google’s algorithms can’t yet determine what is good and what is bad. That’s why the company has set up a team of humans (around 10,000 or so) to take care of the job. The initiative doesn’t only target brand mentions. The purpose of these evaluators is to help improve the quality of the search results in general. Unlike the manual spam team, which can apply manual actions on websites, the search quality evaluators can’t directly influence search rankings. Instead, they follow these guidelines to evaluate websites and provide feedback about the search results to Google. From the guidelines, we can observe that Google demands the lowest rating to be given to websites with negative or malicious reputation. One criteria would be harmful pages that contain malware or that are phishing for information (page 37), but we can also see on page 43 that the evaluators should consider low BBB ratings and other sources that expose fraudulent behavior. We can also include the issue of Fake News. Fake News websites purposely create these fake stories as shocking as possible, not to influence people necessarily, but to gain hype on social media, which brings traffic to their websites which eventually makes them money from ads. These fake stories can ultimately even rank high in Google for specific keywords. Fake News have a big impact on Political Campaigns, as messages spread through Fake News often influence the decisions of uninformed and naive voters. So far, it’s a known fact that social media hype, backlinks and a lot of mentions can get you ranking at the top. Unless the story is critically dangerous, such as one that incites to violence, it can rank there for a very long time without any manual action being taken. Google also has an initiative in which they will work closely with journalists to combat fake news. The search quality evaluators also play an important role, as they can provide patterns that fake news websites use, which can help the algorithm raise a red flag much easier. However, the subject is a lot more sensitive. Malaysia, for example, has passed a law against fake news which could be punished with over $100,000 in fines and up to 6 years of jail time. This raises questions about free speech and corruption (in that particular case). Same thing goes with Google, as they would literally have to censor some websites if they consider them to be fake news websites by not giving them a chance to rank for certain keywords. After the evaluators provide their feedback and Google compiles the info, it gets fed to the algorithm. This way, over time, Google starts understanding the patterns of fake news or malicious websites and websites with a very bad reputation. It’s hard to tell what exactly the algorithm will be based on, but I can speculate looking for reviews in structured data or similar implementations, articles related to fraud or other criminal activities and even news sites or videos. It can then follow patterns, affecting an entire server or network of similar sites related in any way with the initial penalized low quality/reputation website. One thing’s for sure: Google’s algorithms will be constantly improving and will eventually be able to understand if a business has a very bad reputation or if it’s involved in any suspicious or criminal activities. 3. Will Negative Brand Mentions Affect Your Google Rankings? If we’re only talking about a small part of your customers leaving negative reviews or a couple of bloggers trashing you for not accepting their promotion offer, there’s nothing to worry about. In fact, it might actually benefit you if you can get backlinks. However, if we’re talking about massive PR drops, thousands of complaints, serious fraud and the press going crazy over it, then yes, it probably will. But not in the way you might think it will. To be more exact, it won’t directly impact your rankings, but they will ultimately drop because of other indirect factors. 3.1 Is All Publicity Good Publicity? So there are actually two stories. One is about some vegan complaining about the restaurant having no vegan food in it. The vegan community started blasting the Hotel’s (yes it’s actually a Hotel not a Cafe) Facebook page with 1 star reviews. The hotel then started mocking the vegan community. This created a lot of hype with more vegans turning red and massively hitting the 1 star review button but, on the other side, there were a lot of people defending the White Moose Cafe. More recently, a similar story took place after a YouTube content creator asked for free accommodation in exchange for exposure on her channel. The Hotel’s owner mocked her and the bloggers community started rolling in with 1 star reviews. The owners now posted about banning all bloggers from their hotel, just as with vegans, above. Again, a lot of people were defending the White Moose Cafe and, after all this hype, the hotel’s Facebook Page still stands at 4.4 out of 5 stars. The White Moose Cafe kept pumping their jokes by sending the blogger a bill for publicity services, topping over $6 million. While it might sound exaggerated, it’s actually pretty accurate. Considering the amount of hype the posts got around social media and how many news publications caught up on the story, the price seems fair. The blogger actually gained a fair 10,000-20,000 subscribers and most of her complaint videos were monetized. Paul, the owner of the White Moose Cafe, actually has a great post about this in which he elaborates upon the topic and explains how controversy can be a great way of promoting your business, as long as you don’t get trashed completely (what if it was all actually a setup and they actually worked together?). The secret is to also have one side defending your point of view. Another thing you can do is simply ask questions instead of expressing an opinion. While I don’t actually agree with trolling and insulting other people for publicity, I have to admit that I find it kind of funny at the same time, being both a vegan and a blogger myself. Paul has some strong points of view and reading through his blog you can actually see that he’s not a bad person. Now these aren’t really negative brand mentions, as overall, the hotel seems to have gained more than it lost. But there are some that might actually get you into trouble. When users search the web, they often look for reviews. If it’s a product, they look for other people who have previously bought and used it. If it’s a service, they look upon other client’s experiences. Now some people are aware that not all negative reviews are accurate, but there are some review sites that are very trustworthy or, better said, credible. One of them, for example is RipoffReport, which lists scams, usually in the digital marketing field. People can comment on them, so usually there’s a community of people complaining instead of just an individual. I had this user interested if they can make a RipoffReport post mocking one of his clients rank lower, as it was occupying one of the first 5 positions on their main brand search. Screenshot from Intercom showing discussion. I censored the user’s name, photo and website for protection. I told him that the only thing he can do is get the post removed somehow, although I knew he didn’t have any chances. I can’t show off the Google results as I’d probably have to black out 99% of the image, but you have my word, that RipoffReport is ranking high for their brand name and, considering the things said in that post, it doesn’t look very good for the company. If you’re in a similar situation or your overall number of reviews is under 3 stars, then you should consider taking serious action on the quality of your products / services. Sometimes it might not be entirely your fault. For example, people might be complaining about slow shipping. But if it is so, then change the shipping company you work with. People really care about reviews and if they avoid your website because of this, it kind of resembles a bad user experience, which we know Google cares a lot about and could potentially affect your rankings. If this also results in a lower number of branded searches for your website, then it might also have a negative impact on your rankings. As long as the link isn’t coming from malicious websites with malware or a very spammy link profile, I can’t really see how they could directly affect your rankings. If someone wants to give you as a negative example, they might or might not link to you. However, if they do link, they will probably will do it through nofollow links which will still benefit your rankings. So far, we don’t have any data on links surrounding negative mentions, but we do know that links from malicious or spammy websites are bad. The only way they could affect you is that users from the article that speaks badly about you might be able to land on your website, resulting into more negative reviews. Eventually, we will reach a point where Google will become true AI. At that point, whatever the search quality evaluators have done so far, Google will be able to do it itself, probably an infinite times better. Fake news will be a thing of the past and the bot might even be able to distinguish between true fake news or hate speech and offenses and jokes. We’re not quite there yet, but it’s definitely something that Google’s trying to achieve. At that point, we’ll probably also reach the singularity and Google will have already found a solution to world hunger and all human problems so we won’t have to worry about SEO anymore. No, seriously, if your company is convicted for some sort of crime, you probably have bigger problems on your head. That’s not going to be easy to erase and even if you rebrand yourself, through the power of social media and social justice warriors you can’t stay undercover for long. While you should constantly improve your customer care sector, there are some natural negative reviews and brand mentions that you can’t avoid with 100% accuracy. People are more likely to leave a review after a negative experience than they are after a positive one, so you’re already at a disadvantage. The best way of dealing with negative reviews is to answer them, deal with them, learn from them and improve your services. Sometimes, people are jerks. They rate your product or service 1 star for no real reason. For example, I’ve seen people just saying “It’s a bad product” without specifying why and others leaving a 1 star reviews because it didn’t match their expectations, comparing a low end product with a high end one, even though it was a good value for the price. However, by explaining your point of view in the comments you have the opportunity to get your side of the story listened to. For example, I’ve recently read a comment in which one client was complaining about the CPU not matching his socket and that he sent it back but the store wouldn’t accept the return. The store replied and said that the CPU’s pins were damaged and that they even tried to repair it themselves but didn’t succeed. By addressing the issues in the negative reviews, not only can you turn a customer’s frown into a smile but you can also show the other clients that you care, that you are sorry for what happened and that you are willing to learn and improve. It’s hard dealing with negative brand mentions if you can’t track them, don’t you think? Well, Brand Mentions actually has a great feature that can sort out the good from the bad and make your life a lot easier. So, if you want to manage your reputation you can always use the sentiment analysis feature, segment your mentions and deal with them a lot better. Have you ever experienced bad PR or negative brand mentions? If yes, did it affect your rankings? Did you manage to fix the issue? If yes, how? If not, maybe we can discuss it and find a solution. Feel free to start a discussion in the comments section below. The post Can Negative Brand Mentions Hurt Your Rankings? The Answer Might Surprise You! appeared first on SEO Blog | cognitiveSEO Blog on SEO Tactics & Strategies.